Walter V. Robinson, an assistant managing editor of the Globe and the editor of the Spotlight Team, has been a reporter and news editor at the Globe for close to three decades. During nearly 20 years as a political reporter, Robinson covered state and local politics and spent seven years in the Globe's Washington bureau, where he covered the White House under Presidents Reagan and George Herbert Walker Bush. He also reported on four presidential elections and was the Globe's Middle East bureau chief during the Persian Gulf War. 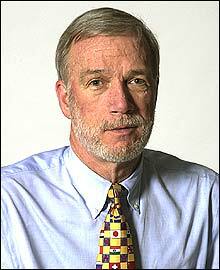 When he returned to Boston in 1992, Robinson worked as the Globe's city editor for a year, then served as assistant managing editor for local news for three years. From 1997 to 1998, Robinson was the paper's roving national and foreign correspondent. He spent much of those years writing about artworks looted by the Nazis during World War II and never returned to their rightful owners. He also reported on the extensive nature of looting of archaeological sites for profit. For his reporting on the illicit trade in antiquities, Robinson was awarded the Archaeological Institute of America's first-ever outstanding public service award in 1999. Robinson is a graduate of Boston College High School and Northeastern University, where he taught journalism part-time for two years. He has been a journalism fellow at Stanford University. In May 2002, he was awarded an honorary degree by Emerson College.